Leprechaun Goes Egypt from Play'n GO is a funny game featuring the well-known Leprechaun on his adventure to ancient Egypt. The Leprechaun is known to love treasure, a lot of gold in particular, so you can join him on his adventure and try to find some gold for yourself. 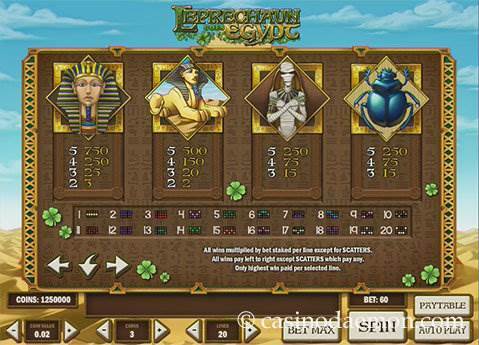 The graphics of the game are beautifully drawn symbols of Egyptian themed items, as well as Cleopatra and the Leprechaun, and you can win a lot of money with wild symbols, scatter symbols, free spins with multipliers and a funny bonus game. The variance of the slot is medium, and you should regularly win something, often lower, sometimes larger amounts. This is a good game that you can also play for just a few rounds, and although the free spins and bonus game can award some decent amounts, you can also win a lot during the base game. The theoretical return to player is 96.75%, which is a little higher than the average online slot. 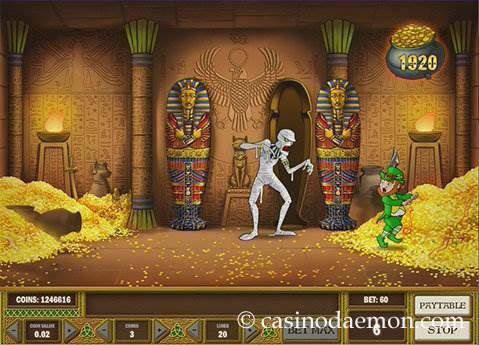 You can also play Leprechaun Goes Egypt mobile on different iOS and Android devices, as the game is fully optimised for mobile casinos. Here, you can play Leprechaun Goes Egypt for free without having to spend real money. If you want to try your luck for real money you can play it at one of the online casinos mentioned on this page. 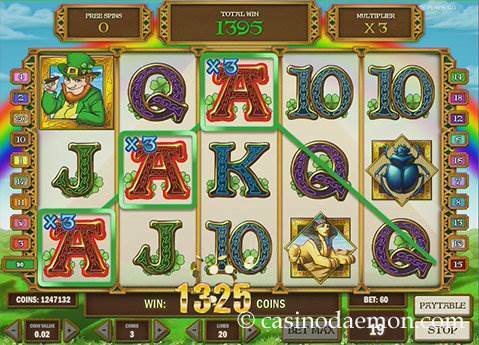 The Leprechaun Goes Egypt slot has a lot of special features, starting with the Leprechaun wild symbol that replaces other symbols for winning combinations, except the scatter symbol, and it also is the symbol with the highest payout when you get it as part of a winning pay-line. Cleopatra is the scatter symbol, and she will give you an instant win starting from two symbols, and when you get her at least three times you will trigger the free spins features. You can choose to either take 5 free spins with an x6 multiplier, 10 free spins with an x3 multiplier or 15 free spins with an x2 multiplier. The bonus game starts when you get three symbols with the pyramid. In this game you have to choose the door where the Leprechaun should enter, and if you are lucky and make your way through all the stages of the pyramid bonus game you can win up to 500x your total bet. Revealing the mummy behind a door ends the bonus game. If you are feeling particularly lucky you can also try to multiply your winnings in the gamble feature. Select the right card colour for a chance to double the amount, or guess the correct card suit for a chance to quadruple your win. 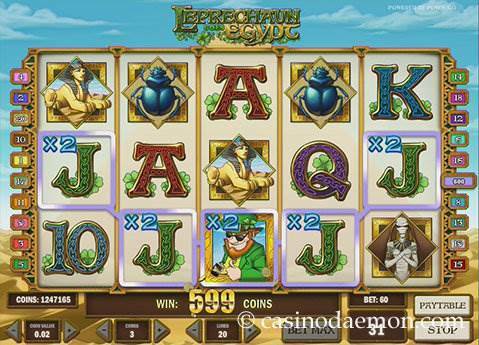 The Leprechaun Goes Egypt slot has 5 reels with 20 pay-lines that you can select individually. Coin values range from £/$/€ 0.01 up to a maximum of £/$/€ 1, and you can also play up to 5 coins per line. The minimum you have to bet in one round is £/$/€ 0.01 for one enabled pay-line, £/$/€ 0.10 for all enabled pay-lines, and you can raise your stake up to a maximum of £/$/€ 100. For maximum chances of winning we recommend playing all the pay-lines. It is also possible to select automatic play options.